Backboard! No, not a spelling mistake! Backboard! It's the rectangular structure to which the 'basket' is attached, and, if the 'shooter's' aim is just right, and the bounce is kind then they just might score two points. Alternatively, if the 'offense' 'drives to the basket', throws the 'defense' off balance with a perfect 'fake' or 'feint', and scores a 'field goal' gaining three points (because the shooter was standing behind the '3-point line') then the team just might earn the accolade 'Dream Team', the name first given to the U.S. basketball team that won the gold medal at the 1992 Barcelona Olympics. 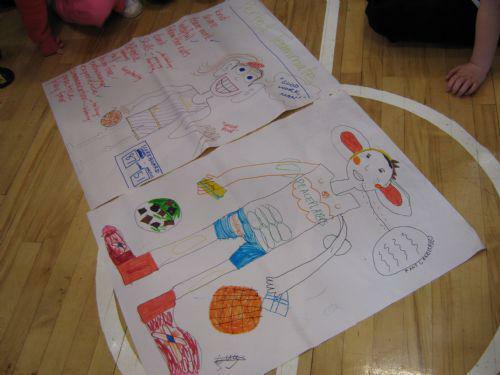 Primary 5 were, of course, the perfect 'Dream Team' as they enjoyed basketball sessions with St Patrick's Primary, provided by 'PeacePlayers' International.